Is there a way to setup an external Bootcamp drive as the default startup disk? I want to do this in order to enable hyper-v virtualization on Windows on a MacBook Air (Early 2015 running 10.12.3 Sierra). Windows 10 is installed on an external SSD in a 2.5" enclosure that uses USB 3.0. I already installed the Windows Support Software from Bootcamp onto it. I can boot up from the external SSD by holding the Option key during boot, but virtualization is disabled. Unfortunately Apple Care reps also couldn't find a solution. I can ask the 'host' to move this post to Windows Software / Bootcamp category. You start a new post with the specific issue in Windows Software / Bootcamp and refers to this post. Experienced users with Windows/Bootcamp will pickup the post more likely in the Bootcamp categoy then here. Let me know what you do/want. Also, check in diskpart, if C: is actually assigned to the Windows partition. There are a few things you can try to resolve the exact issue in your question. 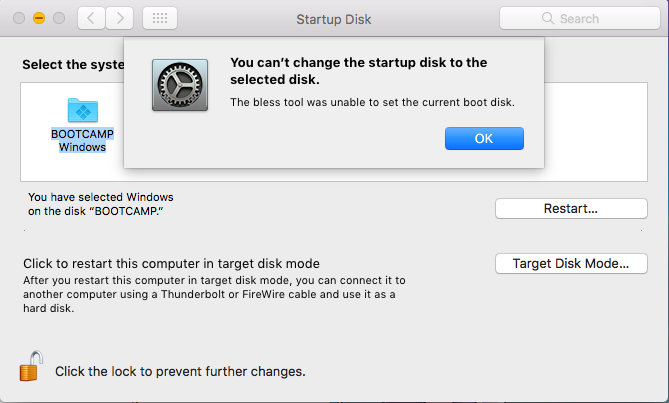 Once you boot in, go to System Preferences > Startup Disk and check to see if you can now select your Windows Bootcamp volume as your startup disk. If you still can't, try the step below. Once you've done this, your Windows Bootcamp volume should be the default startup disk. If you still can't, try the step below. Once you've done this, your Windows Bootcamp volume should be the default startup disk. If you still can't, see other options below.